Louis Vuitton Speedy Bandouliere 35. This is day 2 of my capsule wardrobe challenge (day 1 here). Seeing that we have schizophrenic weather here in the U.K, this would pretty much sum up what I tend to wear on a daily basis. A waterproof outerwear with a hood and a pair of boots to stomp through inordinate number of puddles on the ground (What? You didn't think adults do that?). I woke up at 8.25 a.m this morning and let out a bloodcurdling scream when I saw the clock on my phone. Erm......sorry neighbors. Good thing no one called 911 on my behalf. Lil L had to be in school by 9 a.m. It took me just 2 minutes to pull this look together seeing that we're still using the grey t-shirt and boyfriend jeans as a foundation to build on. I even managed to do a rather impressive fried rice complete with the roaring fire and wok tossing for her packed lunch (actually, it was more like a maniac mom trying to cook in super sonic speed and screaming at LL to inhale, not eat her breakfast). We made it to school just in time to escape the withering looks from the deputy principal which she dishes out to latecomers. The hubby was mad about Barbour jackets. I used to roll my eyes when he started on THE SPIEL about the pros and pros (that's not a typo) of the awesome Barbour jackets. Fast forward two years later, I'm a convert. I've snitched this one by Tokito (or otherwise known as Tokihito Yoshida who'd designed a capsule collection for Barbour) from his wardrobe. I've got my eye on a few others in the store but I've noticed how quickly the smaller sizes sell out. The waxed ones are particularly wind/water proof and coupled with a nice padding or fleece lining, you're all sorted for winter. By the way, have you noticed the number of (deep) pockets on my jacket? I don't have many winter coats (2 at my last count) as I prefer to spend a little more buying one that will not only be practical but also classic enough to last several years without looking dated. If you're rather petite and wear size 8 or 10, you can actually save yourself a ton of money by buying the jackets (XL = size 8, XXL = size 10) from the children's collection. Ooh love the jacket but how big is your hubs Marlene?? I would drown if I tried to steal any of the Grumps coats. I'd be a coat with feet and a head. But good heads up on the children's wear. I've gone off my Barbour - time to trade in for a new one methinks. He's not a big guy but the jacket is rather loose on me. I push the sleeves up and that gives the illusion that it's actually quite narrow. It's a Japanese cut so a lot narrower in the arms and chest so that helps. Very nice look! I love your parka! Great outfit! Love love love the jacket! 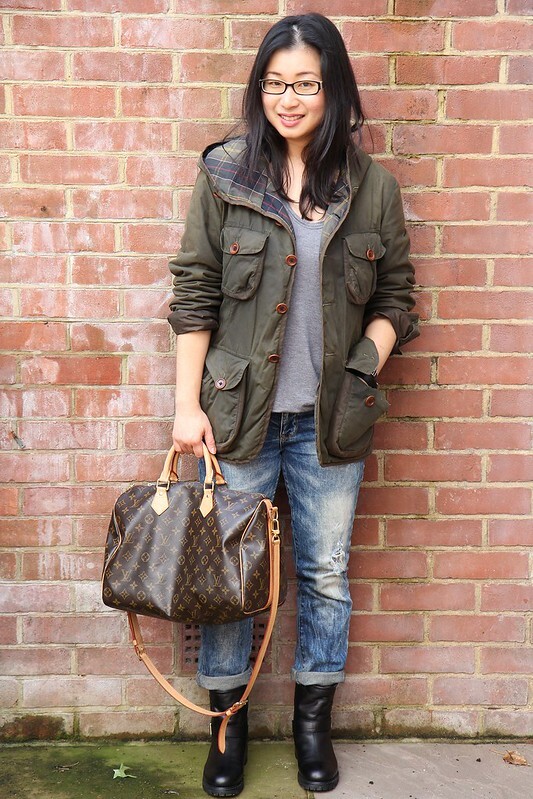 I got a Barbour jacket last year and LOVE it!! It's so perfect for the crazy New England weather. I just got that speedy bag but in Damier. Do you wear it mostly hand held or crossbody? I find my to be really heavy to wear crossbody and just don't love it like I thought I would. Maybe it will grow on me?? Barbour is definitely designed for the cold and wet weather. I tend to wear it crossbody. I tend to switch shoulders every now and then if I'm carrying my camera and gear. I do wish that the strap is a little wider but on the whole, it isn't too bad. Maybe because I'm used to it by now. I love Barbour! I have a jacket purchased from the big store near Bond Street - they had a great selection. Yours is lovely on you. I meant to visit the Barbour store on Carnaby St but we didn't get there in time. The concession at Selfridges was disappointing. There were only a handful of styles. I Ying, despite the rain and all that, I'd much rather have this than trying to survive in the tropics. The heat really gets to me. Hahaha.....I've actually bought another pair of pants because I was getting extremely embarrassed the boyfriend jeans starred in 3/4 of my outfit posts! i LOVE YOUR OUTFIT!!!!!!!!!!!!!!! such a classy outfit that jacket and then the bag. perfect! xO!